Teaching Your Kids to Fight …another look! I recently wrote a post about teaching kids to fight…I was not referring to “roughhousing”. But since writing that post…one of my readers sent me a link http://psychcentral.com/lib/2011/6-benefits-of-roughhousing-for-kids/, which is very interesting information about “roughhousing” and its importance in a child’s growth and development. I do not think that what I witnessed in the park was “roughhousing”, which is why I chose to intervene. I am also not convinced that if it was just “roughhousing” that the park was the proper venue, given all the younger children that were witnessing these two boys “fighting” and kicking each other. 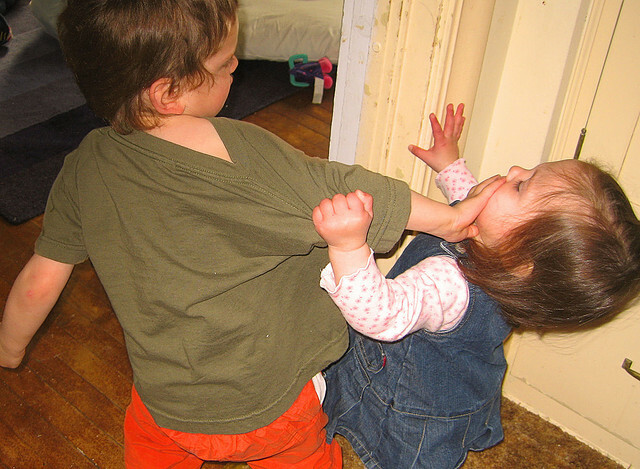 This entry was posted in Parenting and tagged fighting, kids, roughhousing by llpitlwp. Bookmark the permalink.